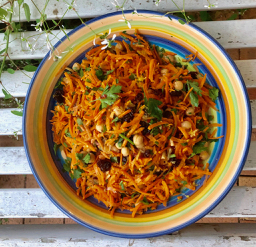 I have been inspired to write up this recipe after sharing in the bounty of friend Jo’s bumper crop of carrots. 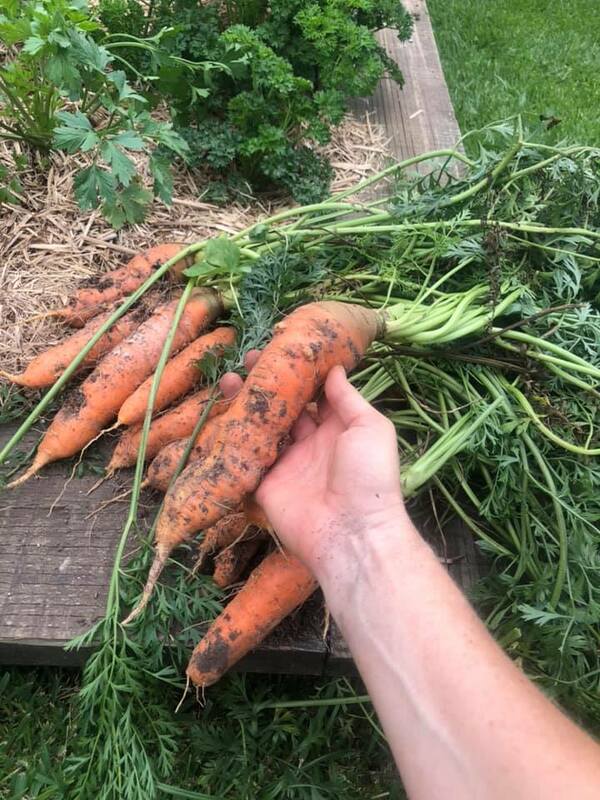 There is nothing quite the taste of a freshly pulled carrot, but they are not that easy to grow in our soil and climate – so I was delighted when some of these beauties came my way. This is one of those recipes where the quality and freshness of the ingredients is paramount – it is all about crunch, zest and tang. This recipe ticks the boxes as wholesome vegetarian,vegan dish. 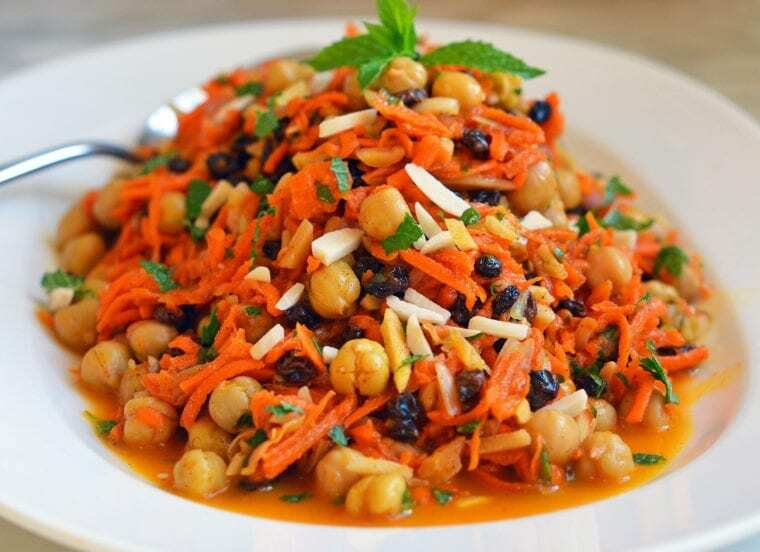 By adding chickpeas you are introducing protein into the dish. Add some carbohydrate into the meal, with couscous or rice pilaf, and you will be covering all the food groups. Simple, healthy and delicious. Based on a recipe by the fabulous Middle Eastern cook Yotam Ottolenghi, it is one I turn to time and time again when I want a change from those run of the mill salads. I have just tweaked it to my tastes with chives instead of onion and a smidgen of garlic, not a whole clove – which I find too overpowering for this salad. Fantastic by itself and especially good with any grilled or barbecued meat – especially lamb and chicken – and did I say that it was healthy too! Preheat oven to 180oC. Spread almond on baking tray and bake for 5 minutes, until the almonds are golden. Remove from oven and cool. Coarsely grate the carrots in a food processor by using the grating plate – done in seconds! Using a large salad bowl, wipe the clove of garlic all around inside, slightly crushing it as you go. Then discard. Tip all the salad ingredients into the bowl and toss lightly to incorporate everything – hands are best. Add the dressing and lightly toss again. Cover and refrigerate for 30 minutes. Adjust seasoning – you may need more salt, lemon or honey, depending on the sweetness of the carrots. NOTE: If you are a lover of onions in salads you can adapt this recipe to your taste. You will need half a red onion that has been very thinly sliced then placed in iced water for 15 minutes – which you then drain and squeeze out before adding it to the salad. Doing this makes it less overpowering and taste sweeter. Jo’s even got the parsley growing right next to her super carrots – all ready for the salad. 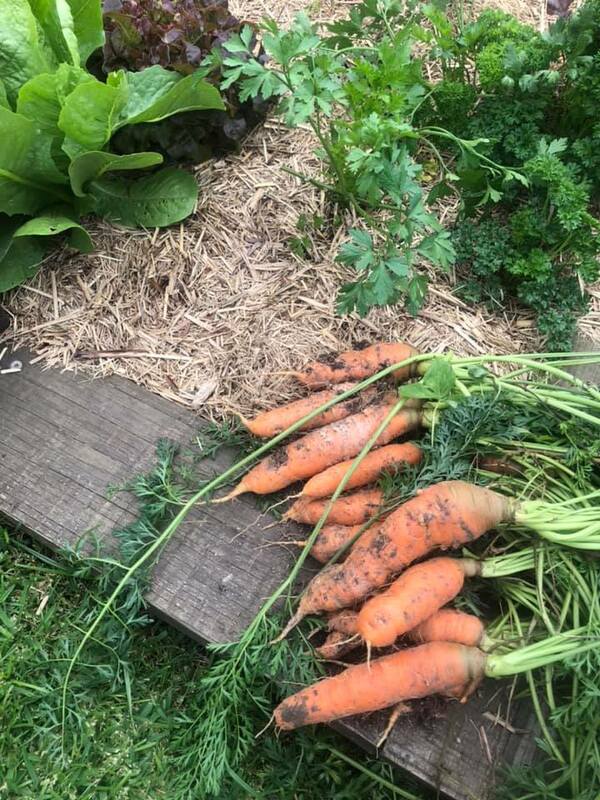 A NOTE ABOUT GROWING CARROTS. Why are they difficult to grow in our soil? Well, we have mostly clay and carrots like a ‘loose soil’ with a good mix of sand – they do not like heavy wet soil. They want to easily be able to push their way down – otherwise they will be stunted and misshapen – any obstacle they meet, like stones and lumps, will warp and twist them too. Carrots also like an old bed – one that has NOT recently been enriched with manures and compost otherwise the carrots fork and look excessively hairy with a mass of fine roots. MY TOP TIPS Plant carrots in a deep bed that has had a hungry crop in it beforehand – like lettuce, corn or broccoli. A deep container is ideal and you can control the soil that goes into it by adding some washed river sand. I use an old laundry wash-tub, with the plug hole left open for good drainage. CARROTS DON’T LIKE BEING TRANSPLANTED – sew directly into the bed then thin out seedlings. 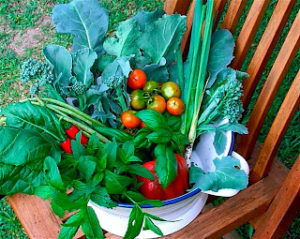 PLANT during the cooler months in the sub-tropics and harvest before the hot, humid months.